MV3092 -The MV3092 vinyl dip coated work vest is ideal for personnel working on or near the water requiring an approved work vest. Designed to be safe, functional and comfortable, the MV3092 work vest comes with SOLAS reflective tape across the front and back for enhanced visibility. 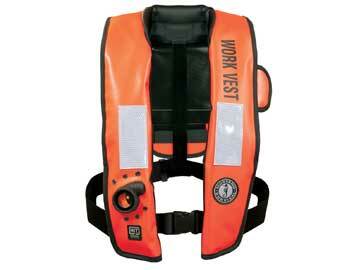 MV3128 T2 - The MV3128 T2 survival flotation vest with SOLAS reflective tape for added visibility is a functional PFD ideal for industrial applications. Four large Velcro™ secured front pockets conveniently store tools, and two D-rings provide lanyard connections. MV1254 T3 - The MV1254 T3 Industrial Mesh Vest offers maximum visibility, mobility, cooling and comfort and is strength tested to 50 mph. ** For government agencies, this product is available manufactured in a TAA compliant location for an additional $76.00. MD3188 - With a comfortable, low-profile fit, the Mustang Survival Inflatable Work Vest offers enhanced mobility and reduced heat stress, allowing crews and professionals to work more efficiently throughout the day. 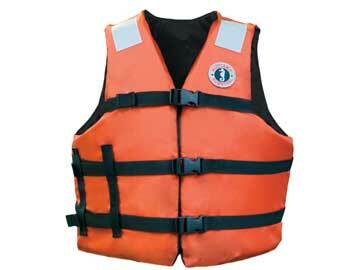 Its 38 lb buoyancy rating also means they'll have the added safety of extra flotation when they need it. ** For government agencies, this product is available manufactured in a TAA compliant location for an additional $46.00. MV3192 - Designed to be safe, functional and comfortable, the MV3192 Work Vest comes with SOLAS reflective tape on the front collar and back for enhanced visibility, a fast tab attachment point for a radio or other equipment and a comfortable mesh lining. Side adjustments create a customized fit in a functional universal size. 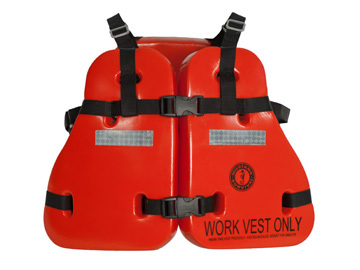 MV3192 Type III / V work vest is ideal for construction, law enforcement, and other personnel working on or near the water. MV1254 - The MV1254 T1 Industrial Mesh Vest offers maximum visibility, mobility, cooling and comfort and is strength tested to 50 mph. 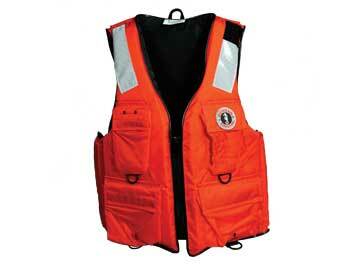 With all it's many features, the MV1254 T1 industrial mesh vest is ideal for work in commercial fishing, commercial transportation, industrial marine, search and rescue, special operations and security sectors. ** For government agencies, this product is available manufactured in a TAA compliant location for an additional $95.00. 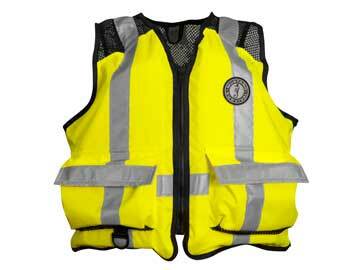 MV3106 T2 - The MV3106 T2 industrial flotation vest is a classic PFD for industrial applications. 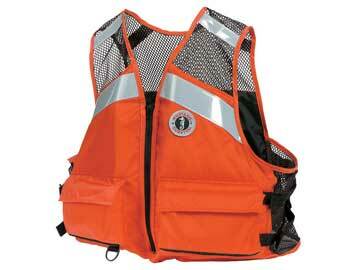 The MV3106 T2 offers large arm holes for mobility and SOLAS reflective tape on the shoulders for visibility. Tug-Tite® adjustments offer a custom fit. MV3104 T1 - Mustang Survival's MV3104 T1 Universal Fit Flotation Vest offers functional industrial flotation with over sized armholes for mobility. 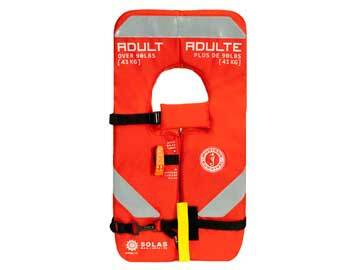 SOLAS reflective tape on the shoulders offers visibility in dark or stormy conditions, works great for boat crews. 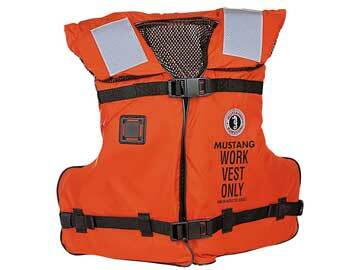 MV8040 - The first and only life vest to have earned four regulatory approvals in one compact design. After several years of extensive design and testing, Mustang Survival is proud to announce the all new 4-ONE. 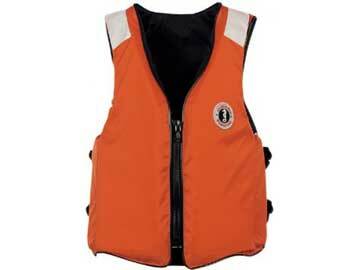 Also available in child size MV8035.